During this summer while it was so hot and dry, I had an itch to do something, but was afraid that anything I might try to plant would be doomed. 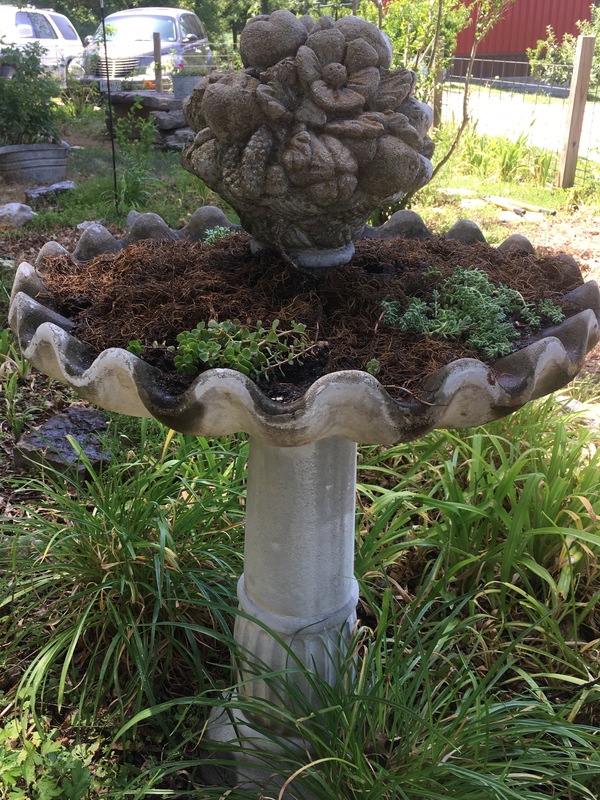 I had been eyeing my birdbath for a very long time, considering turning it into a planter. It was a gift for my first Mother’s Day in our current home, so about ten years ago. I got to pick it out and have had fun planting around it. Over the years I’ve rarely seen a bird take a bath in it, and it doesn’t seem to hold water very well anyway. 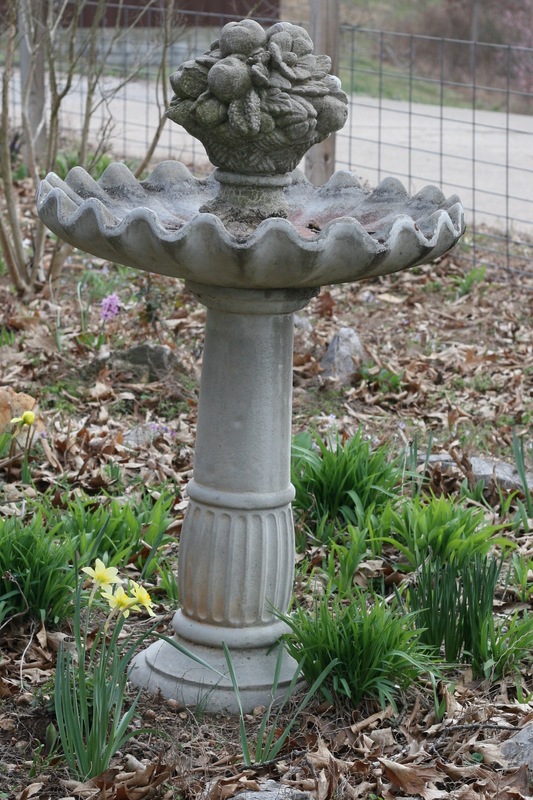 In the winter, the freezing water was damaging the base of the top decorative piece. I started to envision it holding cascading flowers, and the height that it would add to my garden. One day I decided to go for it. I started out by putting some rocks along the bottom for drainage. Then I found some potting soil that I already had and poured that into the birdbath. I had little succulents around the yard in different containers, so I got some of those to get started in it. They’re ones that have come back from winter, so I thought they’d be there perpetually to anchor the soil, and I could just add some new annuals seasonally. I went to Lowe’s and scoured the clearance rack for something that would work. 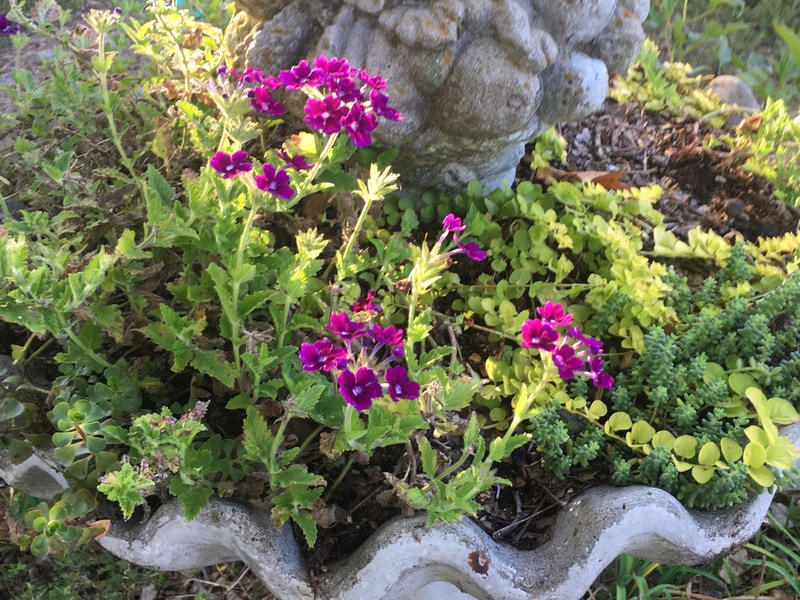 I found a hanging basket of verbena that was originally about $20, marked down to $3, and I thought I could coax some more flowers out of it. I then found three little containers of Creeping Jenny marked down to .30 each. I love chartreuse and the way it contrasts with my favorite cool colors of pinks, and purples, so I bought those, too. I spent a total of about $5 to put my new planter together. I wasn’t sure how it would do, starting out in July, so I didn’t want to invest too much. Since I enjoy watering, and with it being right in the front yard, I was pretty sure that I wouldn’t forget about it. The plants started to fill in nicely and the verbena revived and bloomed beautifully. By September the verbena had filled in nicely. 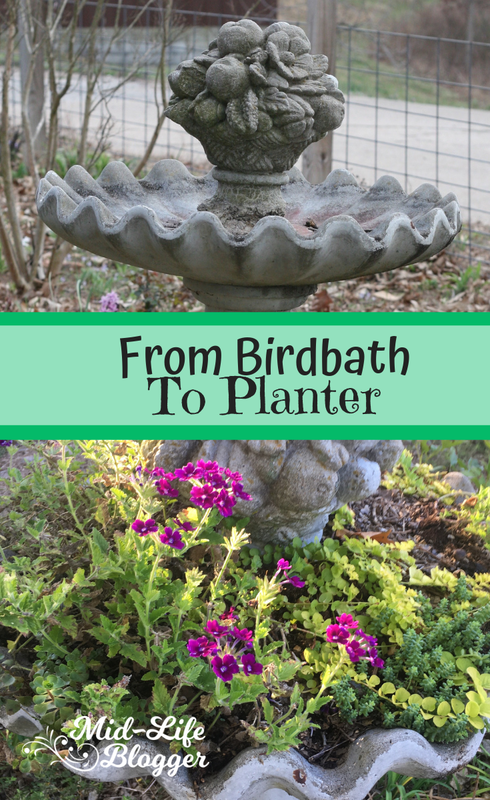 The birdbath planter really lifted my sagging spirits, and turned out to be a perfect summer project! Would you be interested in skincare products that are free of harmful chemicals, and professional-quality makeup? If so, please sign up for my newsletter, Livin’ the LimeLife, about LimeLife by Alcone’s products. I love that idea! How pretty! Thank you! I think I’ll enjoy it more this way. What a great way to use a timeless piece in your garden. Fountains are a critical part of every garden in my opinion and yours is just beautiful! Thank you! I think I would agree with that! I have another water feature that I wrote about recently in Water Pump Upcycle. Birds sometimes visit it so I didn’t feel too bad about repurposing this birdbath. It really did make me happier during a really challenging season!